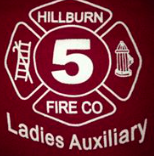 The Hillburn Fire Department Ladies Auxiliary will host a Tricky Tray event on Saturday, July 22 at the Ramapo Senior Center, 319 Haverstraw Road (Route 202), in Suffern. Admission is $5 per person; minors must be 14-years-old and accompanied by an adult. Doors open at 5 p.m. for viewing; drawings begin at 7 p.m.
50/50 tickets will be sold. Funds raised from this event will support the Ladies Auxiliary as it assists the Fire Department in carrying out its mission to protect property and lives in Hillburn and the surrounding community. For more information, contact 845-290-3392.